1 of 2 Lightly coat grill rack or grill pan with nonstick cooking spray. Heat grill or grill pan to medium high. Cook pasta following package directions. Season chicken with 1/4 teaspoon of the salt and 1/4 teaspoon of the pepper. Grill chicken, about 6 minutes per side until cooked through. Set aside to cool slightly, then cut into thin strips. When pasta is done, drain and toss in a bowl with 2 tablespoons of the oil. Set aside. 2 of 2 Heat remaining 2 tablespoons oil in a 12-inch skillet over medium heat. Add garlic; cook 1 minute. Add tomatoes with their juice, zucchini and yellow pepper; cook 3 more minutes. Add vinegar, tomato paste, remaining 1 teaspoon salt and 1/4 teaspoon pepper; cook 3 minutes. Stir in chicken and heat through. Remove from heat. 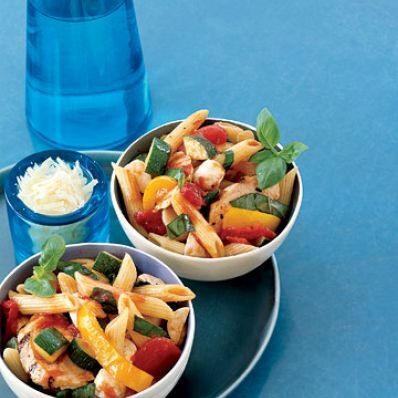 Toss sauce with pasta, basil and mozzarella and serve.